BBK Electronics' OnePlus venture rolled out its second flagship of 2017 yesterday, the OnePlus 5T going on sale just five months after its predecessor, the OnePlus 5 in June. While posing as a plucky startup, the real picture is slightly more complicated. OnePlus is wholly owned by the biggest Chinese phone vendor, with around 30 per cent of the world's number-one market. BBK is also the owner of the Vivo and Oppo brands; OnePlus operates from BBK's Guangzhou HQ. The company built its brand by inviting fans to smash their phones and its lure could compel its young, single, male fanbase to queue for hours to get close to its kit. 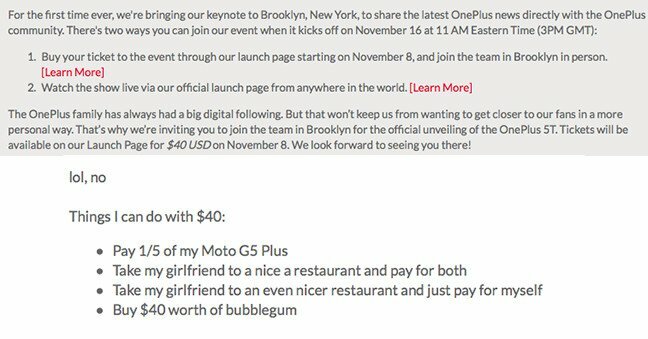 The company charged fans $40 to attend the launch party yesterday – an industry first, we believe. The device itself? It's ditched the dedicated capacitive navigation buttons and compensates for the absence of standard "flagship" features such as optical image stabilisation, waterproofing, wireless charging, and stereo speakers with generous (64/128GB storage) memory (6/8GB RAM) and a lower price. It's around 2mm taller and 1mm wider than the 5. It remains the same price as the OnePlus 5, but adds a superior 18:9 1080x2160 OLED display. The dual-sensor unit has discarded the second "telephoto" lens and instead incorporates one optimised for low light conditions. Facial recognition that uses the front-facing camera (but no specialist iris recognition, and no secondary verification such as IR) has been added. Sales begin on November 21. O2 will again stock the device as the exclusive bricks 'n' mortar retail partner, and there's more information here. Although reviewers – including El Reg – have been using 5Ts for over a week, a perverse embargo schedule imposed by OnePlus forbids us from telling you more until next week. Bear that in mind as you peruse "Hands On" features; they are withholding some quite interesting information.